Now that I'm back at work, I'm trying to get into a routine of bringing my lunch most days - to save money, save time, and (ideally) get some extra nutrients into my diet! 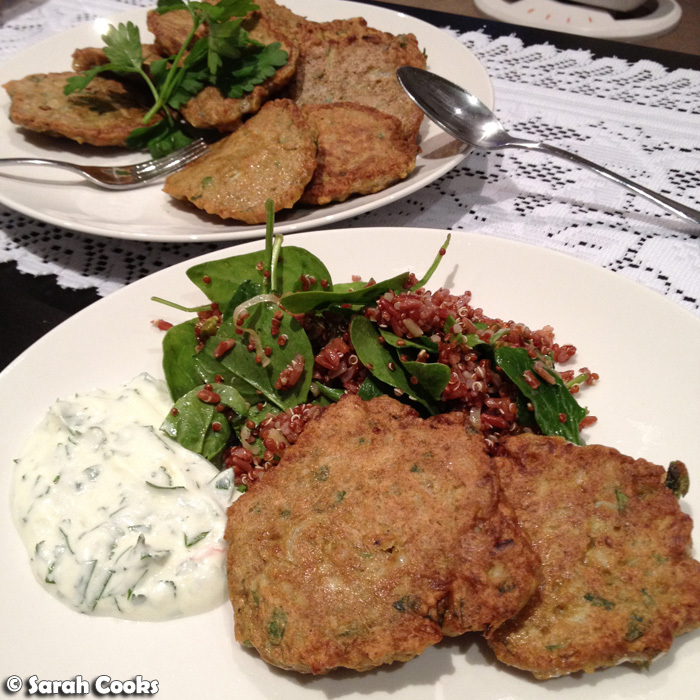 I saw this recipe for "Greens and Grains" in a Jill Dupleix feature in the latest Delicious magazine, and it ticked all the boxes. 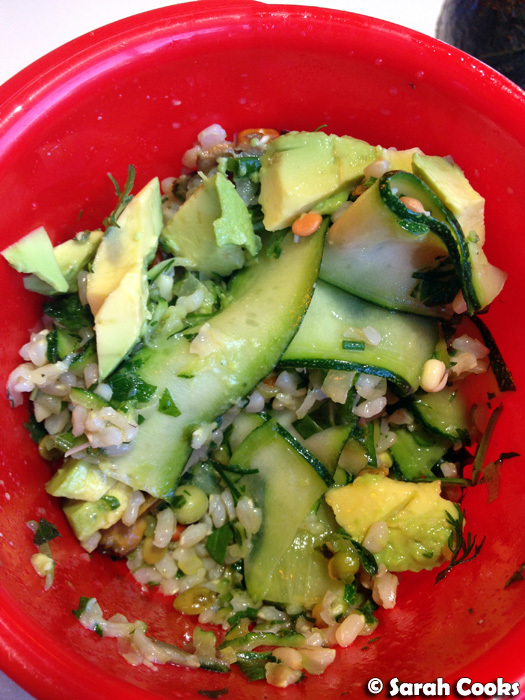 It's a brown rice salad, with the extra nutritional power of zucchini, mixed sprouts, herbs, avocado, and a honey-olive oil dressing. Wow! I've rewritten the recipe below, in my own words, adapting it to ingredients I had on hand, and making the instructions a little clearer. Before we get onto that, though, I wanted to show you a couple of other tasty workday lunches! I find that when I buy lunch, I tend to get meals that are high in refined carbs and protein, with very few veggies. (Think: rice or noodle dishes, dumplings, sandwiches or hot dogs etc.) So, when I bring lunch in, I try to stuff as many vegetables in there as possible! I used a lovely Beatrix/Let's-a-loaf ciabtta, spread it with hoisin sauce and butter (the butter was to replace that strange pâté/butter/lard thing that Vietnamese bakeries spread on their banh mi), and filled it with poached chicken breast, and loads of grated carrots, cucumber, coriander and chilli. Super fresh and tasty! It was a bit of a pain to prepare all the different veggies and chicken the night before and pack them in separate little plastic containers, but it made enough for two days' worth of delicious faux banh mi... and I had even more carrots and cucumbers leftover to bulk out a lunch that would have otherwise just been a sad little tin of supermarket spicy tuna and rice. Ok, so back to the "Greens and Grains". As I said above, I rewrote the recipe to make the steps a bit clearer and easier. 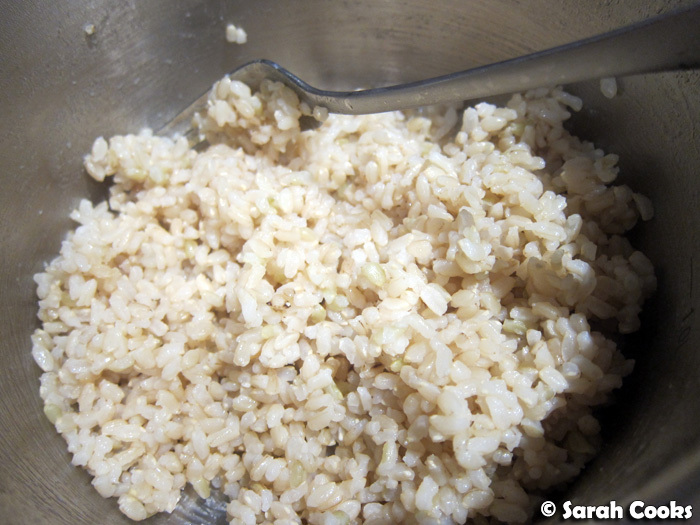 The method for cooking brown rice, in particular, is important. Jill's recipe simply says to cook the rice "according to packet instructions". However, I've always struggled cooking brown rice "according to packet instructions", finding that it usually ends up tough and dry. I recently tried Bill Granger's brown rice method (from his Everyday Asian book), and found it makes perfect brown rice - so those are the instructions I've included below. The most difficult part of this recipe was doing the zucchini - grating and/or slicing it isn't too hard, but draining the excess liquid sure is! I tried just letting the slices drain in a sieve, but they still remained quite damp. Drying them with a clean tea towel worked much better. (I pressed the zucchini slices between two tea towels, and I squeezed the excess liquid out of the grated zucchini with another tea towel - phew!). Even though it's a bit of a pain, I wouldn't be tempted to skip this step. Zucchinis hold heaps of water, and the final salad will get soggy if you don't. Another tip: brown rice, whilst fabulous, does seem to mute other flavours. I'd suggest seasoning the salad quite strongly with salt and pepper (obviously taste as you go! ), and being very generous with flavoursome herbs. In addition to the mint stipulated in the original recipe, I added chives, dill and rocket. And here is the finished salad! The recipe makes enough for four generous servings, which I had over the course of a week. As you can see, the salad is topped with avocado - to prevent the pieces going brown, I brought the whole avocado to work, scooped out a quarter of an avocado each day, and kept it in an airtight container in the fridge. (Obviously adapt this to your own work-fridge situation and your own tolerance for brown avocado!) If avocado isn't your thing, I think this salad would be divine topped with cold poached or smoked salmon, or even tinned tuna (mmm... extra protein and omega-3's). But having said that, it just struck me that this salad is both gluten free and vegan - bonus! I think this is perfect for a work lunch. It tastes great, is easily transportable, healthy, and substantial enough to keep you going throughout the afternoon without weighing you down or leaving you bloated. And even if you do end up eating it mindlessly at your desk, with all those veggies, protein and fibre, you can rest assured you're doing your body some good. To cook the rice, rinse the brown rice under running water until the water runs clear. Place in a small heavy bottomed saucepan with 1 cup (250ml) water. Bring to the boil, then clamp on the lid and turn the heat down to the lowest possible. Allow to cook for 30 minutes, then turn off the heat and let sit, with the lid on, for a further 15 minutes. Remove the lid, fluff up the rice with a fork, and allow to steam dry and cool slightly. 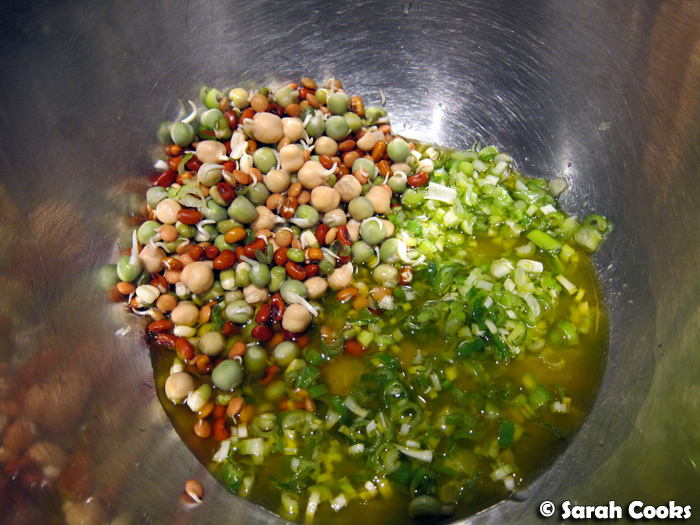 Toast the nuts and seeds in a dry frying pan for a few minutes over medium heat until lightly browned and fragrant. Set aside. 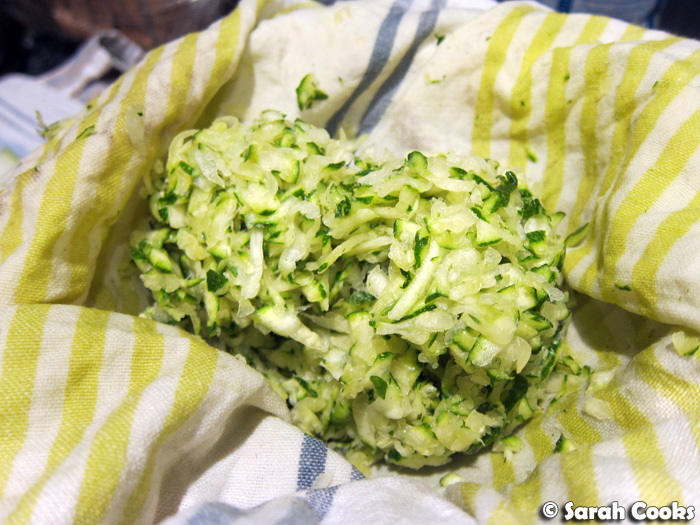 Coarsely grate one of the zucchini, and squeeze out the excess water using a clean tea towel. 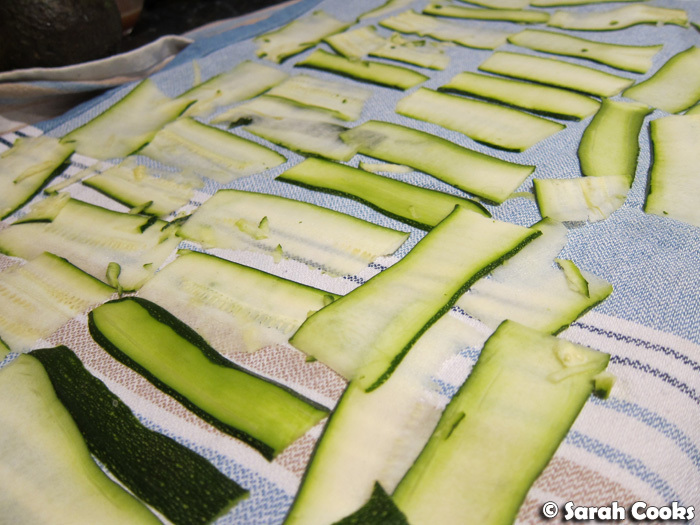 Thinly slice the other zucchini using a vegetable peeler and drain on a clean tea towel. Finely slice the spring onions and place in a bowl that is big enough to take all the ingredients later. Whisk together the olive oil, lemon juice and honey, and pour over the spring onions. Now - assembly! 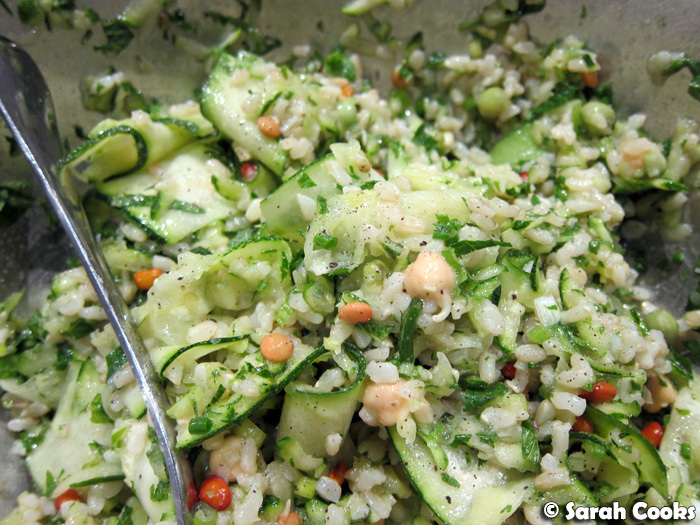 To the bowl with the dressing and spring onions, add the sprouts, brown rice, toasted nuts and seeds, zucchini, rocket and herbs. Season well with salt and pepper. Toss with a fork to combine. Top with avocado slices to serve. So, work lunches: do you buy or bring in? 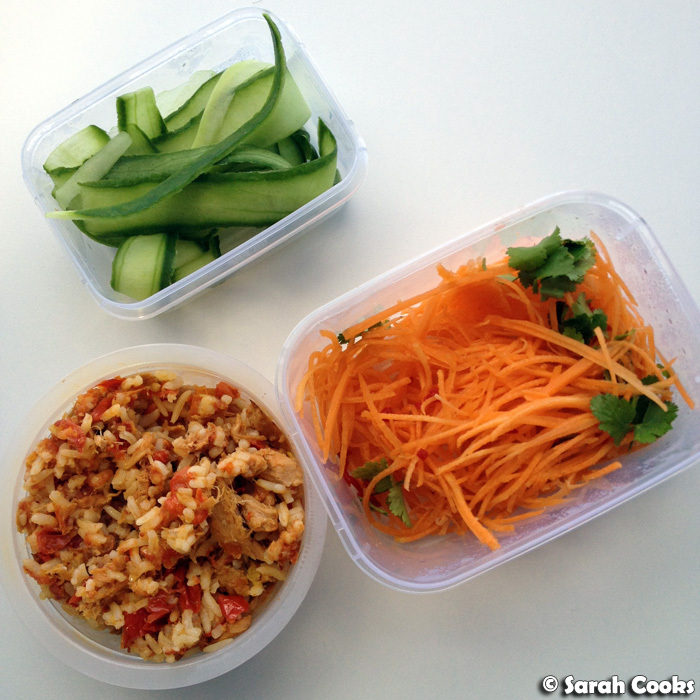 What are your favourite workday lunches? Yum that salad looks delicious and I love the idea of the Faux Banh Mi! I like to take home made soup to work for lunch but I am not always that organised! 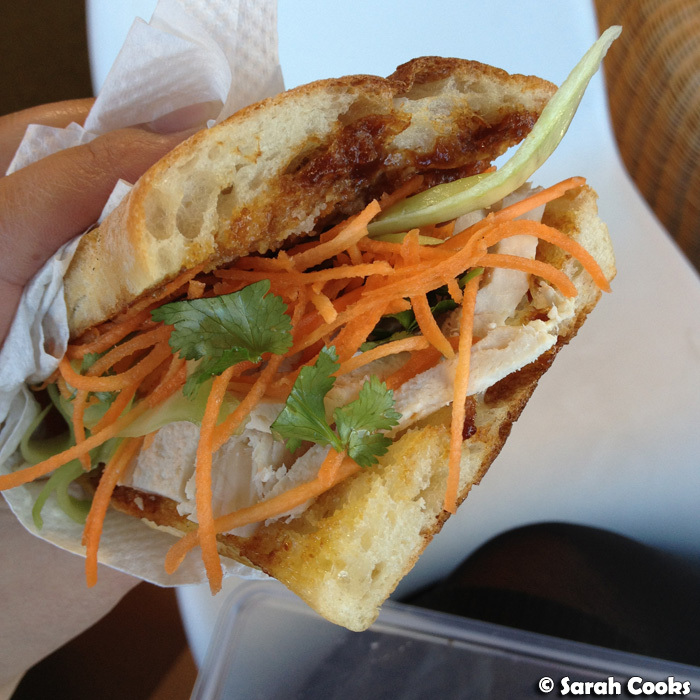 BYO banh mi is an awesome idea! I try to pack a lunch most days and it's usually dinner leftovers. We've made a habit of cooking meals that serve 4-6. On Monday it was Kentucky fried tofu with carrot and spinach, today I'll be having the last of the tomato soup with a cheese arepa, and tomorrow it'll probably be a soft-shelled lentil tacos.